Gosh, I just don’t know where the time is going. I’m a little late with sharing your photos from February but I guess it’s better late than never. 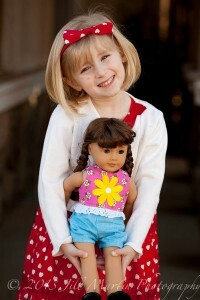 Lynne is an Aussie who has been making a new wardrobe for her granddaughter’s American Girl doll. Lynne’s challenge has been to make these clothes without having a model to try them on as her granddaughter is living in the US at the moment. 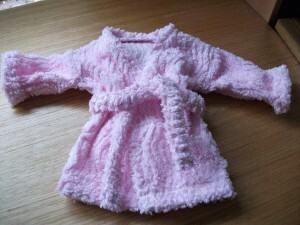 Lynne extended the sleeves on my summer dressing gown doll clothes pattern and made this lovely chenille winter dressing gown although she did find the thicker chenille fabric a little tricky to work with. Lynne has done a great job and I can see why, ‘Hailey is thrilled’. Suzanne has been having lots of fun with my How to Make Doll Clothes course and says, ‘Thank you so much for all the work you put into your patterns and tutorials. The tutorials are invaluable. 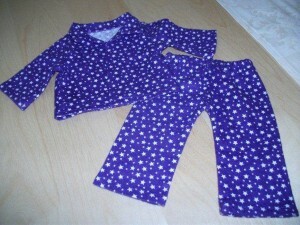 I had never sewn a hem or a casing and I was able to make those clothes! I am on week 4 of your course and I am learning so much. These wonderful photos show Elizabeth, McKenna, Julie and Marie Grace proudly wearing their new clothes. Suzanne has done an awesome job and I love the retro look. Pila has added puff sleeves to my summer dress pattern and finished it off with some gorgeous lace. 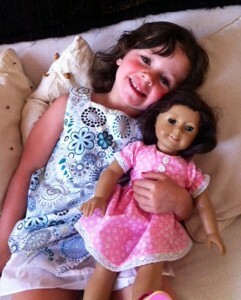 Her granddaughter, Gabrielita thinks her doll, Maria, looks beautiful and she now wants a dress just like the doll’s dress!!!! 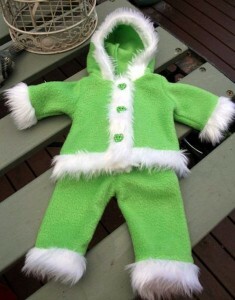 Jill has also been having fun with my How to Make Doll Clothes course and posted these photos to my Face Book page. I thought they were just too cute not to include in my blog! I love the bright colors and the big smiles. 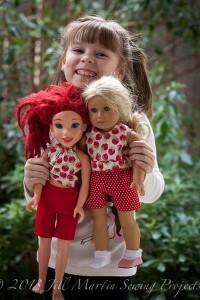 I look forward to seeing more doll clothes creations from Jill. Here’s Kit in her party shorts and a sporty tee shirt with the raglan seam picked out in yellow piping to match the yellow balloons on the shorts. Another way to add interest to the t-shirt pattern is to use a contrasting color for the sleeves and why not do both – contrasting sleeves and piping! The summer dress on the right was made with lawn which Katy found, ‘was hell to work with – frayed all over the place – never again!’ Katy ended up lining the bodice and skirt with interfacing to give the material some substance. This is great information to pass on to everyone – fabric that looks beautiful may not necessarily be so much fun to sew with and you may also need to modify the pattern a little to make it work. Katy also used bias binding for the waist and hem trim, which gives a slightly different effect from my pattern but it has turned out really pretty and Kit looks pleased with her new dress too. Thanks so much to everyone for sending in your photos and sharing your sewing experiences with me. It’s fantastic to hear so many stories and receive your feedback. I’m sure everyone else loves to see your work too so keep them coming in. By the Way (BTW) what does everyone think of my new title ‘Share & Tell’? It just came to me as I was finishing off this blog and thought the new title is kinda cute. 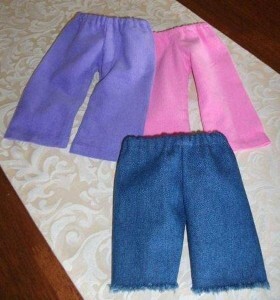 Hi Ann, You may find my blog ‘A Great Tip for Resizing Your Doll Clothes Patterns’ helpful. WoW! those are cool!!! i loooove them!!! I love your new Share and Tell name, great choice! I have a 14 inch doll Little mom I think she is called. When I use patterns fom the 14 inch collection they are too tight , but when I use the ones from the 16 inch collection they are just too big. It is very frustrating. I did see you have given advice on resizing so I’ll give it a go. Any other ideas would be welcome too. Hi Helen, I would love to know how you get on with adjusting your patterns using my resizing tip. Hi Chris, I’m glad you discovered my website too 🙂 I also have Belle and think she is really pretty so I’m sure you will love her when she arrives. 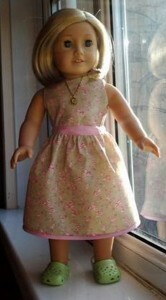 It would be wonderful if you sent me photos of the doll clothes you make for her and I will share them in a future blog. She sure is pretty and so excited about her arrival. I’ll be sure to let you know when she comes I a make her some cloths. I’m already asking (actually telling) hubby she’s going to need a chair and a bed so he’d better get his tools ready lol. I am shure that my doll felicity would love them!